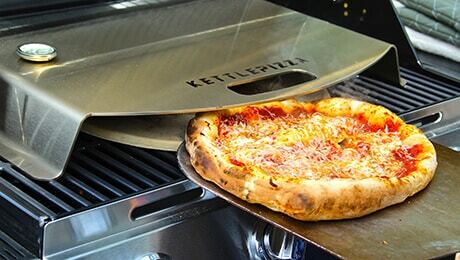 KettlePizza oven kits are stainless-steel inserts that fit into your gas or charcoal grill creating a cooking chamber to maximize heat and cook amazing pizza. Heat rises, so when you lift the lid on your grill, the heat escapes, making it almost impossible to maintain the high temps needed to cook great pizza. Our pizza oven inserts provide a front opening that eliminates the need to lift the lid on your grill. With less heat escaping, you can achieve pizza oven temperatures in excess of 750°F, temperatures that your kitchen oven can’t even reach, temperatures closer to those of commercial wood-fired pizza ovens! On a Weber style charcoal grill, the pizza oven insert fits between grill bottom and lid. Use charcoal briquets along with some hardwood and you can achieve temperature in excess of 750 degrees F. The hardwood helps to elevate the temperature and provides a nice wood-fired flavor to your pizza. 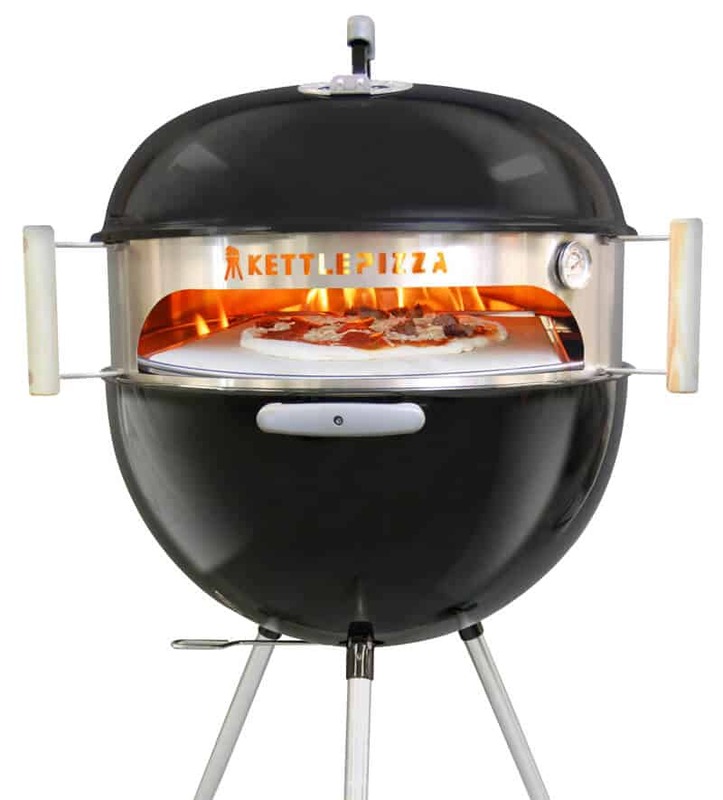 On a gas grill, the KettlePizza simply sets directly on the grill grate. Simply bring the one-piece stainless pizza oven insert and cordierite stone up to temperature (shown on the built-in thermometer), and it’s ready to cook your pizza, lid up. Temperatures are dictated by the amount of BTU’s you grill has, temperatures between 600-700 degrees F are common. 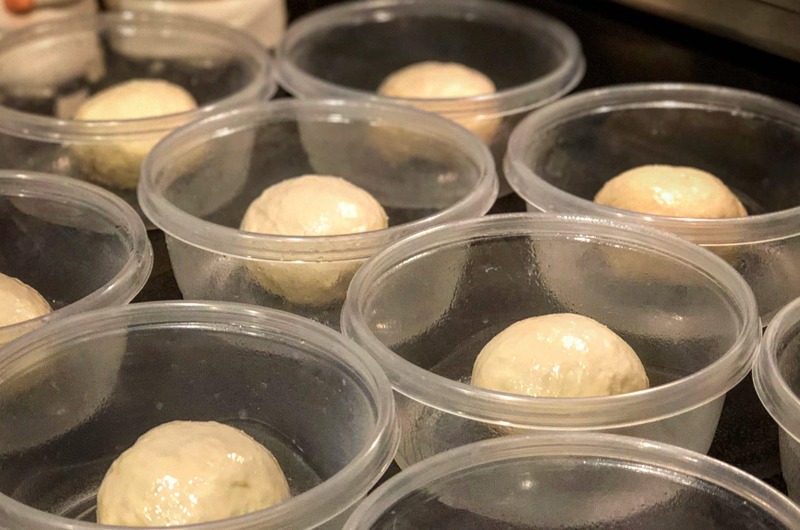 Whether your cooking one or two pizzas for the family or 10-20 pizzas for a party, YOU can make amazing pizza everyone will love! Need recipes? Check out our Recipe Page for pizza and other delicious items you can cook in your KettlePizza Oven. Need more inspiration? Check out the KettlePizza Owners Group on Facebook! 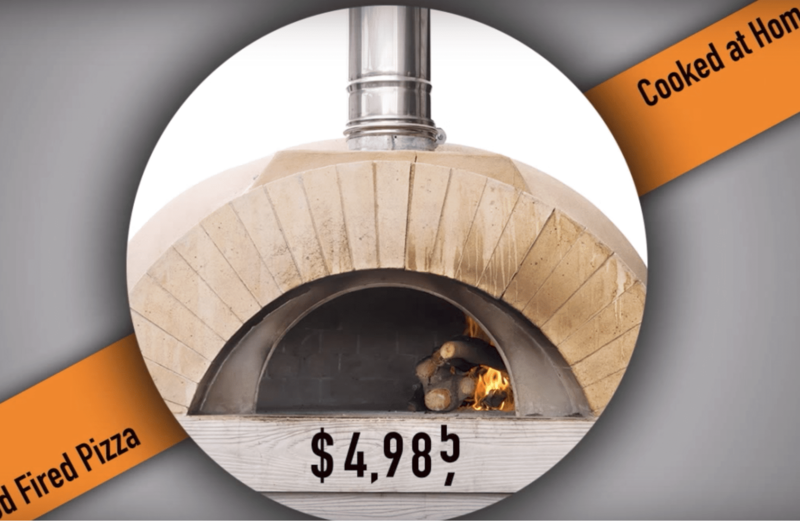 We Guarantee Your Satisfaction With Our Made in USA Pizza Oven Kits! 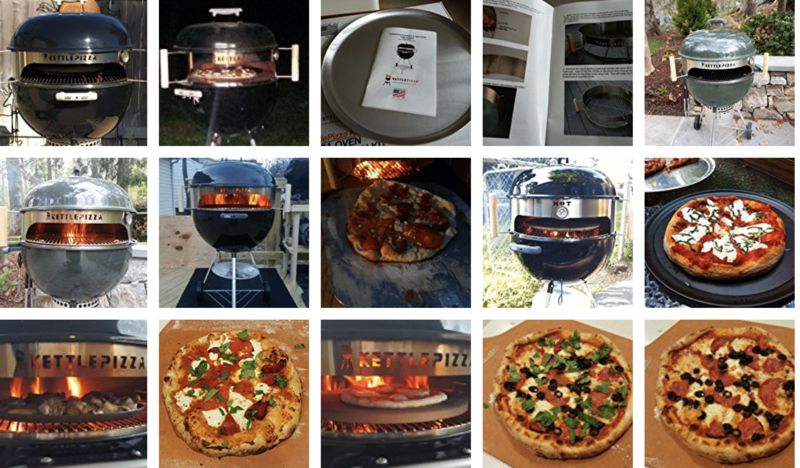 We are proud to have our pizza oven kits featured in these reputable media outlets!